Lots of noise lately about the billable hour, the dissatisfaction of corporate counsel, the awkwardness of every idle lawyer calling long dormant clients "just to say hello." Actually, only the volume has increased; these are the same discussions that have taken place for years. It's true in every business, and no less true in the practice of law: if you don't like the service, don't return. I once attended an excellent training class (shout out to the American Management Association) about 6 months after my promotion to manager after years as an individual contributor. The instructor gave the class a simple assignment. Take a clean white sheet of paper. Turn it sideways. Along the left margin list the names of your employees. Along the top list the competencies (skills) expected of the employees. At the intersection of each name and competency, rate your employees' performance as great, average or poor. We gleefully went about the task, amidst snickering like "Boy, it turns out all my people stink" and "I wish I could get new people." As young managers heady with the wisdom bestowed on youth, we were as confident in our competence as we were dismissive of our employees. For most of us, there was no bell curve: most of our employees were poor performers in most categories. Then the instructor dropped the bomb. He characterized the grid as less an indictment of our employees than a report card of our own skills as managers. If we know what it takes to succeed in the roles, and we know which employees are not performing to expectation, then as managers we have an obligation to address the situation by providing the tools, training or alternatives so the employees can succeed. It's not just sensible, it's our fiduciary obligation as managers of the firm. I can assure you, the room was silent as those of us who gave such poor grades to our employees realized we had just been our own harshest critics. The object lesson is that if you know what the problem is and you don't do anything about it, then you're complicit in the outcome. If the local pizzeria consistently forgets the mushrooms but you keep going back, whose fault is that? If your doctor continually disrespects the value of your time and makes you wait 45 minutes after your scheduled appointment, why are you surprised? If you encounter the same slow service every time you walk into your local electronics retailer, then why not find a new retailer? I'm not alone in enjoying the horror stories of terrible service committed by law firms against their in-house counsel clientele. I've moderated countess roundtables of corporate counsel and outside lawyers and I've been the instigator in asking for juicy anecdotes to liven up the "law firm bashing" session. In fact, there's one fantastic corporate lawyer who has spoken on several panels with me. Whether true or apocryphal, she has the most outrageous stories of outside counsel blunders and so I keep inviting her. But this begs the question. Has she gotten any better at hiring outside counsel over the years? Does she fail so spectacularly in instructing her outside law firms that the outrageous outcomes should come as no surprise? Those that bemoan the billable hour, do they have such low standing in their organization that they can't negotiate an alternative structure and then defend this to the business owners? Is the average corporate counsel so lacking in credibility that when a deal goes sour his job hinges not upon the merits of the deal (or lack thereof!) but upon the brand name of the outside firm he hired -- a name that in all likelihood (with apologies to Biglaw lawyers everywhere) most business owners don't know or care to know? We're in this together. It's nice to see the usual dialog finding so many new venues. But these aren't new problems. 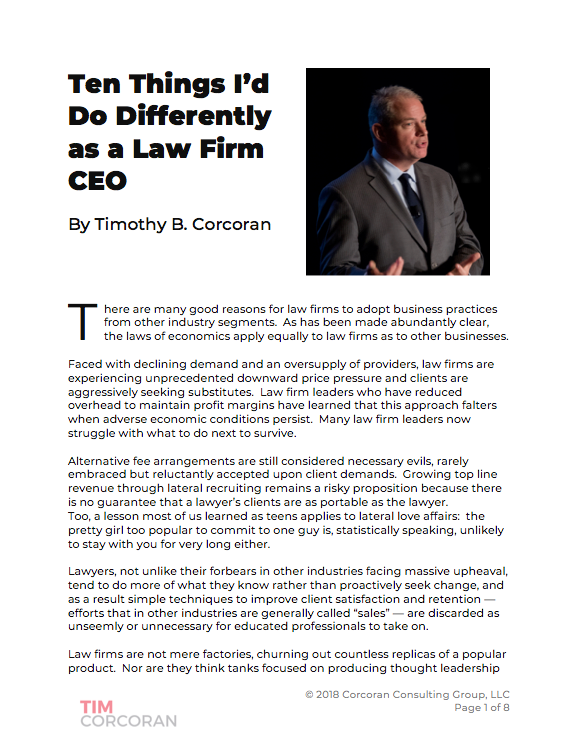 Corporate counsel are as invested in finding a new model as outside counsel. Whether the billable hour is dead, I don't know (Bruce MacEwen has a perspective). But like that new manager grading his employees, are we ready to take responsibility for implementing the change we know is needed? Let's all take out a clean white sheet of paper and find out.